Recently, the constant rain has limited me to drawing in my car. I know Seattle enjoys a reputation as the rainy city. However, we usually get a few breaks throughout the day. 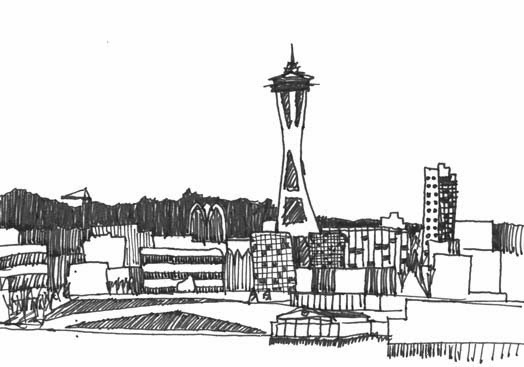 I am using this as an opportunity to draw the Seattle skyline. A variety of spots in Seattle host parking lots with great views of the city's iconic buildings. My favorite spot is the Don Armeni Boat Ramp at Seacrest Park. The boat ramp parking lot has super wide and long stalls to accommodate boat trailers. These spots often go unused in the winter. This provides a sketch starved artist a perfect view of downtown and the surrounding neighborhoods. Another great spot is the Hamilton Viewpoint Park directly above Seacrest Park. The viewpoint parking lot wraps around the northern tip of West Seattle, providing panoramic views of the sound, Elliot bay and downtown. 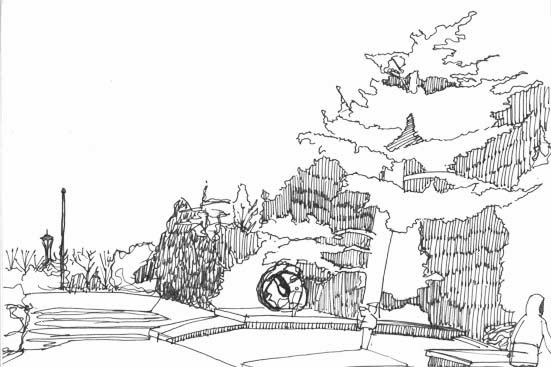 My final spot to draw the Seattle skyline is Volunteer Park. The parking lot for the Seattle Asian Art Museum offers a great view over the park's reservoir to the space needle beyond. I always thought this juxtaposition of the modern space needle with the natural style of the Olmsted park was a perfect metaphor for Seattle. Really nice sketches Logan. I like your style. Excellent sketches. And thanks, Logan, for the ideas about sketching locations! Very nice sketches Logan and I like how you have a theme.